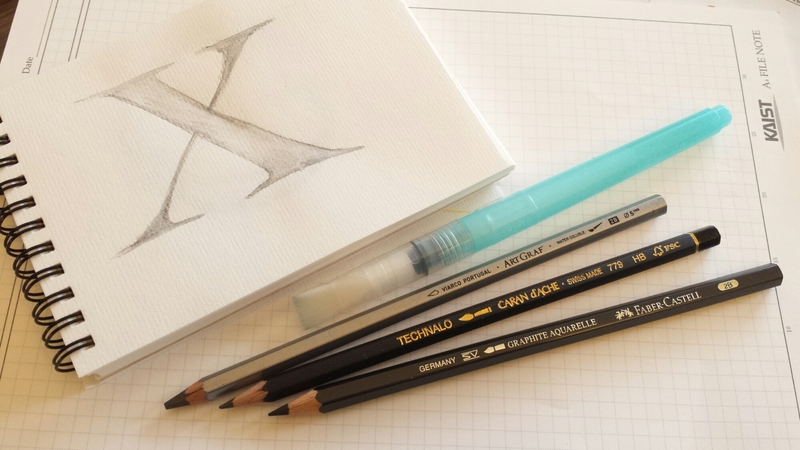 I like calligraphy but I don’t always like getting out all the tools and paraphernalia, so I often doodle letter forms with pencil. It’s the kind of exercise that really gets you thinking about the shapes and proportions contained in a letter. Water-soluble graphite pencils such as the Viarco ArtGraf, Caran d’Ache Technalo or Faber-Castell Graphite Aquarelle can be fun in this regard; finish off with a square water brush (the kind that stores water in its barrel and is therefore mess-free and portable) and voilà!